Definition at line 25 of file CQAnimationWindow.h. Definition at line 263 of file CQAnimationWindow.cpp. Definition at line 275 of file CQAnimationWindow.cpp. Definition at line 331 of file CQAnimationWindow.cpp. References mAnimation, mpCopy, mpLayoutThread, mpScene, pdelete, CWindowInterface::removeFromMainWindow(), and CQLayoutThread::terminateLayout(). Definition at line 431 of file CQAnimationWindow.cpp. Definition at line 390 of file CQAnimationWindow.cpp. Definition at line 286 of file CQAnimationWindow.cpp. References CQIconResource::copasi, CQIconResource::fileExport, CQLayoutThread::getParameterWindow(), CQIconResource::icon(), mpLayoutThread, mpWindowMenu, CQIconResource::play, CQIconResource::roll, slotLayoutStateChanged(), slotStopLayout(), and toggleUI(). Definition at line 395 of file CQAnimationWindow.cpp. References CQCopasiAnimation::getNumSteps(), CQCopasiAnimation::initialize(), mAnimation, mpScene, CQCopasiAnimation::removeFromScene(), and slotShowStep(). Referenced by setScene(), and slotSwitchAnimation(). Definition at line 353 of file CQAnimationWindow.cpp. References CQLayoutScene::getCurrentLayout(), mpModel, mpScene, pdelete, CQLayoutScene::recreate(), and setAnimation(). Definition at line 500 of file CQAnimationWindow.cpp. References CQLayoutThread::createSpringLayout(), CQLayoutScene::getCurrentLayout(), mpCopy, mpLayoutThread, mpScene, CQLayoutThread::stopLayout(), CLayoutState::tagLayout(), and toggleUI(). Definition at line 437 of file CQAnimationWindow.cpp. References CQAnimationSettingsEditor::initFrom(), mAnimation, and CQAnimationSettingsEditor::saveTo(). Definition at line 323 of file CQAnimationWindow.cpp. Definition at line 477 of file CQAnimationWindow.cpp. References CQLayoutScene::getCurrentLayout(), mpScene, and CQLayoutScene::recreate(). Definition at line 448 of file CQAnimationWindow.cpp. References CQLayoutScene::getCurrentLayout(), mpLayoutThread, mpScene, CQLayoutThread::randomizeLayout(), CQLayoutThread::stopLayout(), and CLayoutState::tagLayout(). Definition at line 420 of file CQAnimationWindow.cpp. References CQCopasiAnimation::applyToScene(), CQCopasiAnimation::getNumSteps(), mAnimation, and mpScene. Definition at line 464 of file CQAnimationWindow.cpp. References CQIconResource::icon(), mpCopy, and CQIconResource::play. Definition at line 370 of file CQAnimationWindow.cpp. Definition at line 483 of file CQAnimationWindow.cpp. References CQIconResource::icon(), mpLayoutThread, CQIconResource::pause, and CQLayoutThread::stopLayout(). 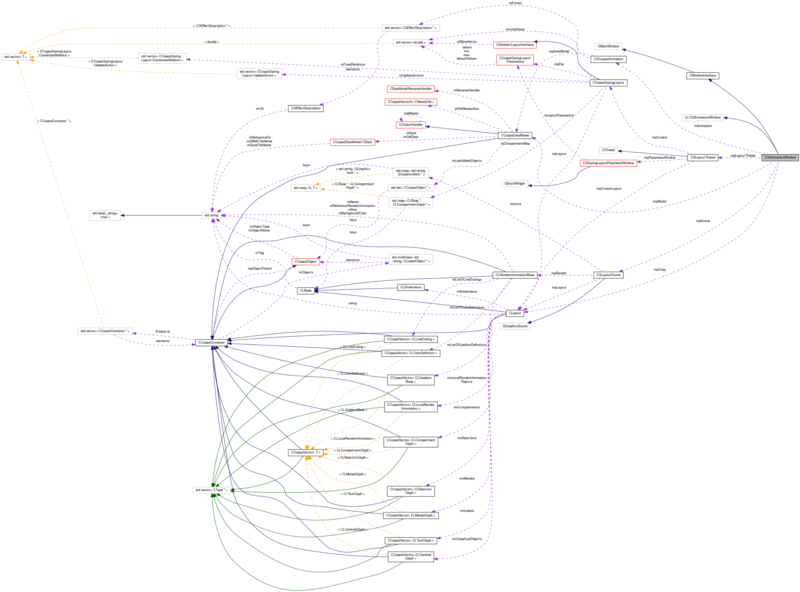 Referenced by init(), and slotAutoLayout(). Definition at line 53 of file CQAnimationWindow.h. Referenced by setAnimation(), slotEditSettings(), slotShowStep(), and ~CQAnimationWindow(). Definition at line 55 of file CQAnimationWindow.h. 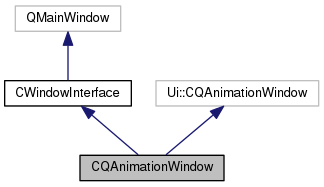 Referenced by slotAutoLayout(), slotStopLayout(), and ~CQAnimationWindow(). Definition at line 54 of file CQAnimationWindow.h. Referenced by closeEvent(), init(), slotAutoLayout(), slotRandomizeLayout(), toggleUI(), and ~CQAnimationWindow(). Definition at line 51 of file CQAnimationWindow.h. Definition at line 50 of file CQAnimationWindow.h. Referenced by setAnimation(), setScene(), slotAutoLayout(), slotLayoutStateChanged(), slotRandomizeLayout(), slotShowStep(), and ~CQAnimationWindow(). Definition at line 52 of file CQAnimationWindow.h. Referenced by getWindowMenu(), and init().